Karen James at SUNY Old Westbury. VO Mid-Atlantic Outreach Coordinator, Karen James, has leafleted 30 campuses this semester, reaching more than 19,000 students with Vegan Outreach booklets! 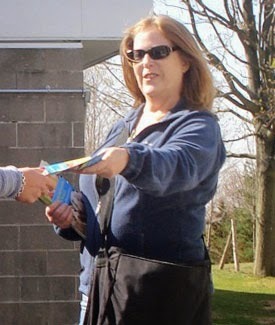 Since the spring of 2010, Karen has gotten booklets into the hands of over 134,000 individuals! “Cold day, so not a lot of conversations at Housatonic CC, but I met Joyce, who received a Compassionate Choices from me last year and went vegetarian. We discussed dairy, I gave her a Guide to Cruelty-Free Eating, and she is going to cut out milk, and work on reducing cheese by trying some of the vegan options I pointed out! Also, Matt remembered me from last semester; he cut out pork and red meat altogether, and has reduced eating fish and chicken to 2x a week! Gave him a Guide, and again, pointed out alternatives and congratulated him on his efforts! “Chilly, but busy. I met Ariel, who wants to go vegan after reading the Even If You Like Meat. She thought it was horrible how the animals are treated so cruelly. I gave her a Guide. Jeff said he got a booklet from me last semester and stopped eating all meat! He is now working on eliminating dairy and eggs, heading toward vegan! I also gave him a Guide. Help push the spread of veganism onward: Click here to have your donation doubled today!